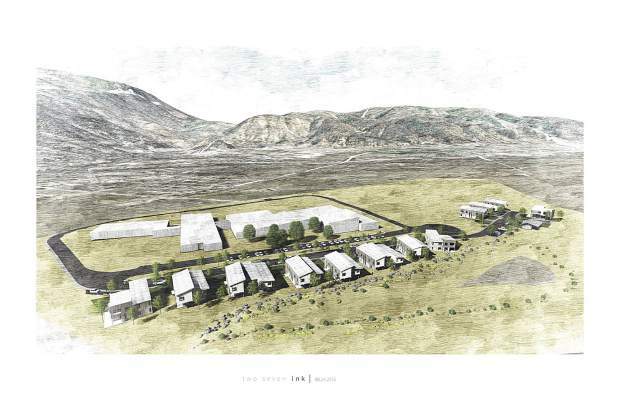 This drawing shows how the Basalt Vista housing proposal would blend with Basalt High School. 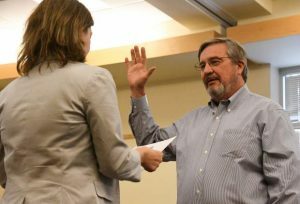 Two local governments and a nonprofit are pumping nearly $8 million into an affordable-housing project and hoping that the town of Basalt will waive development fees to prevent the subsidy from growing. Habitat For Humanity Roaring Fork teamed with the Roaring Fork School District and Pitkin County government on the 27-unit Basalt Vista affordable-housing project. It’s the first partnership of its kind to pursue new affordable housing in the valley. 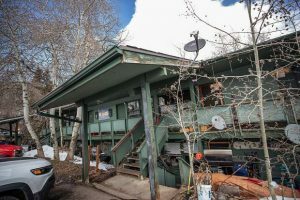 “It’s been a little bit of serendipity — the school district had land, Pitkin County had money, Habitat For Humanity had know-how,” said Scott Gilbert, president of the chapter. 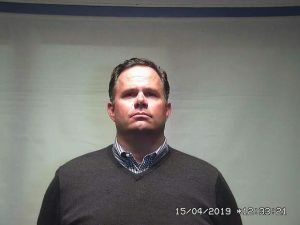 The project is estimated to cost $15.7 million. Sales of the 27 condominiums will raise about $8 million, or $296,000 per unit, on average. The downvalley school district is contributing land south of Basalt High School valued at $3.2 million. In return, 15 of the condominiums will be sold to teachers or school district staff. 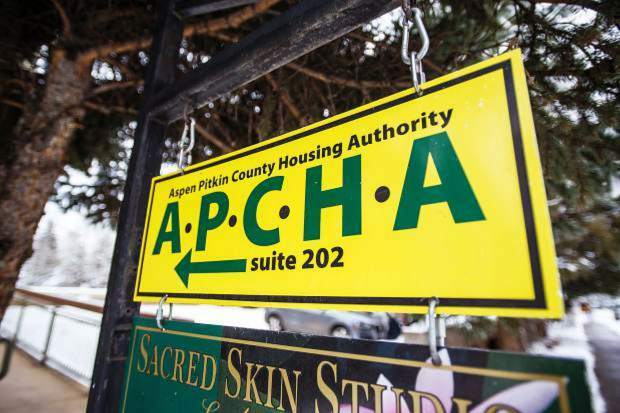 Pitkin County dipped into a fund dedicated to affordable housing to contribute $2.75 million. In return, 12 of the condos will be reserved for sale to people who work in the county. Habitat is contributing $1.75 million in addition to its know-how. It’s getting nothing in return except the satisfaction of providing workforce housing. “This is what we do. The reason (the subsidy) is so high is it’s 27 homes,” Gilbert said. A typical developer wants to make a profit, Gilbert said. Habitat For Humanity simply wants to make sure the project is affordable. Therefore, it’s willing to invest $1.75 million in the project. “We’re going to lose what it takes to make the project more affordable for teachers,” Gilbert said. Basalt Vista is under final review by the Basalt town government this month. The Basalt Planning and Zoning Commission voted 6-0 Tuesday night to recommend approval. The project goes to the Town Council on Tuesday. In addition to seeking approval, Gilbert and his team will ask the council to waive development fees for the project. The total bill is about $500,000, by his accounting. The Basalt Municipal Code gives the council discretion on waiving fees. The project will target households with incomes 60 to 100 percent of the area median income. The plan is to tie the price of homes to income rather than construction costs, Gilbert said. The sales price wouldn’t exceed 30 percent of monthly income for the homeowner’s monthly mortgage payment. There will be four two-bedroom units, 17 three-bedrooms and six four-bedrooms. They will be arranged in nine duplexes and three triplexes, with units ranging in size between 1,200 and 1,600 square feet. The appreciation will be capped at 3 percent annually so that they remain affordable for teachers in the future. Initial prices will range from $245,000 for the least expensive two-bedroom units to $345,000 for the most expensive four-bedroom units. 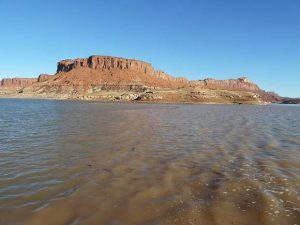 Technically the project didn’t have to seek approval from the town of Basalt. Colorado law allows school districts to bypass local land-use reviews for projects. Gilbert said that wouldn’t have been a good way to enter the neighborhood. The development partners voluntarily applied for Basalt approval. If the project is approved, construction would start next spring, and the first units would be completed by late 2018 or early 2019, Gilbert said.